How do you feel about you? I'm serious, when was the last time you stopped , took a few moments out of your busy day and thought about how YOU are? Many of us judge how we are by our success in business, how are kids are doing in school/sport, how organized our home and life is BUT that is not what should define us. If you took all those things away, what are YOU made up of, what defines YOU as a person? That can be a very tough question for many people. What is inside you that gives you value, and if you think there isn't anything then you are very WRONG my friend. You have been given great power and very special gifts and using those gifts can help so many people around you will empower you. Before we can get to that point though for some, we need to understand that no matter life has thrown at you, what struggles, hardships, or tragic experiences you have had...YOU ARE ENOUGH! Now whether you believe me or not is a different story. 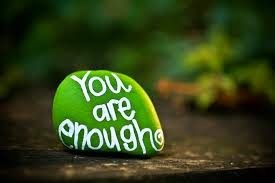 The phrase "I AM ENOUGH" may be something that you need to repeat to yourself 100x a day or maybe just a few times when you start to doubt yourself. Believing this though will absolutely change your life! It will empower you in your marriage, friendships, work relationships and in teaching your kids that all of us how special value and to cultivate that. Set aside some time this week to sit down (uninterupted) with a pen and paper and write down your strengths. You can also then write down what is holding you back from believing that those qualities make you good enough; is there something in your past? Is there something/someone right now that is "pushing you down"? This process takes you being VERY vulnerable and that can be really really hard but very worth it. Try to do this exercise this week just finding what you are all about and WHY YOU ARE ENOUGH. because you are!!! You can do this and once you become vulnerable, you also then become open to deep meaningful relationships and you give so much too all you meet. My passion has been reignited! I have been a personal trainer for almost 14yrs now and i love it more with each passing year. I have been the owner of my own studio for over 3yrs now and it has been an incredible growing experience for me in so many ways, but most of all I have developed a deep passion for whole food nutrition. Real food and how it effects our bodies is completely under utilized; we turn to pills and multi-vitamins to "fix" us instead of working on using the nutrients in whole foods to prevent or heal MANY issues. I take pride in the training programs I design and the results I get for my clients BUT without the right eating plan, those results are limited. I have gained a lot of nutritional knowledge over the last 2yrs but not qualified to assess a clients current patterns/habits and then design a program based on thier symptoms, issues and goals. I will be a certified nutritional coach in 3 months and I am BEYOND excited about what that will allow me to do for my clients. I hate seeing clients struggle with weigh-ins and motivation. We all have stresses and struggles and we have many things happening in our bodies that we may not even be aware of and those factors are stopping our progress; unbalance digestive enzymes, adrenal glands that are overworked, not enough micro nutrients so that our bodies cannot absorb the proper nutrients or MANY other option but how would you know? I am SO excited to be learning more and bringing this to regular and new clients a like! Be ready to transform your bodies people! This is going to change the way you looks at Health!!!! As I learn more, I will be blogging about it so be ready to pick up lots of tidbits of info that will help you on your journey.